Just like to let you know the Sonny Society Jazz Band were superb when they played at my husband's 80th birthday party. They made the evening a great success. 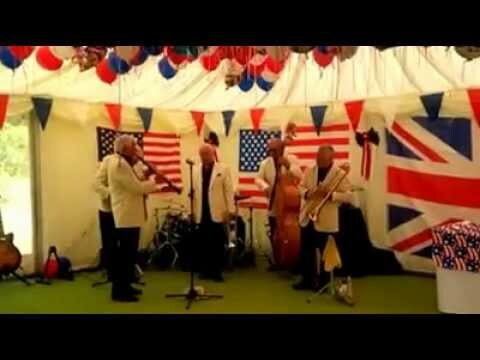 The Society Jazz Band is a 6 piece traditional and Dixieland jazz band based in Leicestershire. The band have been going for nearly 30 years and have a vast experience at playing at all sorts of events including weddings, parties, corporate events and public concerts. The Society Jazz Band recreates the classic Dixieland Jazz Band sound of New Orleans. Expect music by the like of Louis Armstrong, Joe "King" Oliver, Jelly Roll Morton, and W.C. Handy as well as repertoire from famous British trad jazz musicians Kenny Ball, and Humphrey Littleton. The Society Jazz Band was formed nearly 30 years ago and since then has performed at a huge variety of events across the UK and Internationally. The band is comfortable performing at any size of event from intimate garden parties through to large scale outdoor concerts. The band has performed at a number of high profile events and in June 2011 the was proud to be selected as the support band for Rod Stewart on his UK Tour. Venues incuded Newbury Racecourse, Elland Road Stadium (Leeds), Liberty Stadium (Swansea) and Pittrodire Stadium (Aberdeen). Please would you pass on my thanks to the band for doing a really fantastic job for the Rod Stewart concerts. Thoroughly professional and a pleasure to work with and Rod’s production team were all very happy. Just wanted to send my thanks. Thank you for helping to make our Wedding Day so special. All the musicians were superb! Technical Requirement: 2 x 13 amp sockets.